Microscan has announced the release of WebLink 1.1 – the latest version of the world’s first web-based barcode reader setup and control interface – supporting several new feature upgrades for the company’s MicroHAWK Barcode Reader platform. Part of the revolutionary MicroHAWK platform launched in September 2015, Microscan introduced WebLink as the first ever web-based barcode reader interface. WebLink software is stored on the MicroHAWK barcode reader, rather than external equipment. The WebLink interface is accessed through a web browser by navigating to the barcode reader’s IP address using any web-enabled device on the local area network (LAN). WebLink’s open protocol framework eliminates integration hassle and device incompatibility across factory networks, IT equipment, and control systems. Since no software is installed on equipment used to control MicroHAWK readers, WebLink does not require the intervention of IT to facilitate installation or upgrades. In addition, custom reader settings can be saved as WebLink job files to the MicroHAWK reader’s internal memory or to external devices and are completely portable to new integration environments and equipment. WebLink is the world’s first barcode setup program that is used entirely in a web browser. Access reader controls on your most common devices and use your favorite browser as your workspace. No software to install, no compatibility obstacles, no experience needed. Without manuals, without software, without any special barcode reading expertise, WebLink empowers any user to simply read barcodes. Decoding has never been easier with MicroHAWK (ID-20, ID-30, ID-40) Series and WebLink: the incredibly intuitive way to read barcodes. When managing the commonly high speeds involved with automated barcode scanning and vision environments, it’s crucial that your barcode readers can communicate data at the rates that the system and environment require. The type of interface you decide to use on your devices can help or hinder production. Most scanner offer options for RS-232 serial and USB connectivity but Ethernet offers distinct advantages for optimizing efficiency in automated systems. Faster data speeds – Ethernet connections offer high-speed data transfer that won’t limit production. Unlimited connections to the PC – With several independent Ethernet connections, PCs can manage multiple tasks in parallel for optimal productivity. Unlimited distance from the PC – Span greater physical distances without losing data speed and move or centralize PCs away from the production floor. Remote device management – Control devices anywhere there is a network connection and troubleshoot systems without leaving the office. Standardized cables – Common connectivity with all Ethernet equipment for no-hassle networking. Easy integration to MES and ERP – Ethernet-based MES and ERP systems pair naturally with Ethernet devices saving integration time and equipment. Microscan has announced the availability of EtherNet/IP communication on its ultra-compact machine vision smart camera, Vision MINI Xi. One of several cameras in Microscan’s award-winning AutoVISION machine vision product suite, the Vision MINI Xi offers a complete machine vision tool set for high-speed identification, inspection, and other automated tasks with the optimal size and shape for space-constrained machines. With the release of the Vision MINI Xi Smart Camera in March, Microscan introduced industrial Ethernet TCP/IP to its miniature smart camera line, enabling integration with machines designed for Ethernet connectivity. With the release of AutoVISION 3.0.2 software, the Vision MINI Xi now supports communication via EtherNet/IP for use in industrial environments. 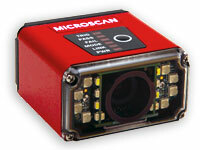 Microscan has announced the availability of the Vision MINI Xi industrial compact smart camera with embedded Ethernet. As part of Microscan’s award winning AutoVISION machine vision product suite, this tiny powerhouse is packed with features for close-range industrial auto ID, inspection, and other machine vision applications. 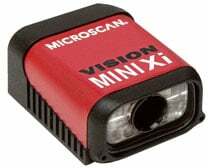 Microscan’s new industrial Vision MINI Xi is the world’s smallest fully-integrated smart camera with embedded Ethernet, measuring in at 1 in (25.4 mm) x 1.8 in (45.7 mm) x 2.1 in (53.3 mm) and weighing 3.2 oz (91 g). The Vision MINI Xi features both Ethernet and serial connectivity, a 24-volt interface, and optically isolated I/O in one compact package.